Chronic back pain is a global health problem affecting millions of people worldwide and carries significant economic and social morbidities. Intervertebral disc damage and degeneration is a major cause of back pain, characterised by histological and biochemical changes that have been well documented in animal models. Recently there has been intense interest in early intervention in disc degeneration using growth factors or stem cell transplantation, to replenish the diseased tissues. Bone Morphogenetic Proteins (BMPs) have been approved for clinical use in augmenting spinal fusions, and may represent candidate molecules for intervertebral disc regeneration. BMP13 has an important role in embryonic development and recent genetic evidence shows a role in the development of the human spine. This study explores the effect of BMP13 on a damaged intervertebral disc in an ovine model of discal degeneration. We found that, when injected at the time of injury, BMP13 reversed or arrested histological changes that occurred in the control discs such as loss of extracellular matrix proteins. 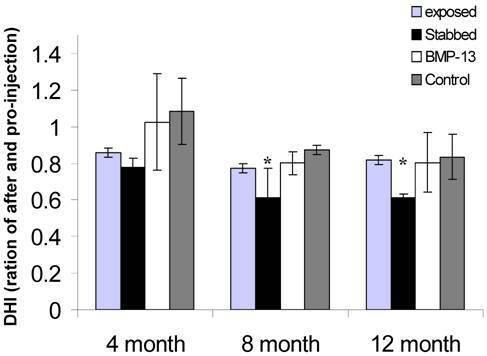 In addition, BMP13 injected discs retained greater hydration after 4months, and possessed more cells in the NP. Taken together, BMP13 may be a potent clinical therapeutic agent when used early in the degeneration cascade to promote healthy disc tissue. Back pain is at epidemic levels in Western countries and growing in significance as societies and emerging economies age. Disturbances of the intervertebral disc (IVD) such as herniation and degenerative changes are a major cause of pain. The IVD, with its central, highly hydrated proteoglycan-rich gelatinous core nucleus pulposus (NP) and outer, high tensile, collagen I fibre-rich annulus fibrosus (AF) is responsible for much of the tensile strength and cushioning of the spine . Damage or injury to either of these structures leads to degenerative biochemical and biomechanical changes that can cause pain and loss of function . The current treatment options for chronic back pain depend on its severity and persistence for any individual patient. In a proportion of patients pain persists and treatment will involve various major invasive surgeries including partial or total disc replacement and, as a last resort, spinal fusion. Treatment solutions that target early disc degeneration are eagerly sought [3,4]. Bone Morphogenetic Proteins (BMPs) are known to stimulate the growth of skeletal tissues in both developing and adult tissues  and are used to augment spinal fusion. BMP-7, BMP-2 and BMP-14 have also been tested in animal models of IVD regeneration [6-8]. BMP13 (also known as growth & differentiation factor-6, GDF6 and cartilage derived morphogenetic protein-2, CDMP2) has an important role in early embryonic and ocular development  and more recently was shown to play a role in spinal column development . Congenital gene mutations caused spinal vertebral fusions, perhaps revealing a crucial role for BMP13 in disc tissues which could be applied to adult tissue maintenance and repair. In vitro studies suggest BMP13 promotes the expression of chondrogenic marker genes in a variety of cell types [9,11,12] including bovine intervertebral disc [13,14]. Indeed BMP13 was recently shown to inhibit expression of both early and late markers of osteogenic differentiation in vitro . BMP13 may be a candidate disc regeneration molecule with a reduced risk of bone formation in the IVD. A sheep model has been developed to study slow degeneration of the IVD using histological and biochemical analysis [16-18]. This study aimed to examine the effect of a single injection of recombinant human BMP13 protein at the site of a controlled, consistent annular stab injury in an ovine pilot study using histological, immunohistochemical, magnetic resonance imaging (MRI) and x-ray analyses to address whether early discal degeneration could be effectively halted or reversed with application of BMP13. Seven male merino wethers aged 2-4yrs were entered into this study. For each sheep, four lumbar discs received either: annular puncture, annular puncture plus BMP13 injection; surgical exposure only (exposed control), or no surgical exposure (non visualized control). The study, was based on an established sheep annular stab model previously described [16,17] and was approved by the Animal Ethics Committee, University of Sydney, Australia. The surgical procedure was performed under general anesthesia, where the fibrosus annuli of anterolateral discs of L2 to L5 were exposed and an incision in the fibrous annulus was made to a 6mm depth using a #11 B-P knife in two discs, with an additional surgically exposed disc used as a control. A 27mm x 10mm titanium screw was implanted into one of the vertebral bodies for later identification of levels. One of the punctured levels received 300μg of BMP13 in 70μl saline immediately following annular puncture, whereas the other one received the same volume of saline (70μl) alone. Following surgery, the sheep were monitored for 2-3 days postoperatively and then returned to the field. X-ray images of the lumbar region were taken immediately post surgery, at 14 days post surgery and thereafter prior to euthanasia. X-ray images of individual animals immediately post surgery (T0) and after 4months (T4), were examined and compared for statistical relationships in discal height. The vertebral body and disc heights were converted to a ratio and measured by 3 investigators as described previously . The average disc height was expressed as the disc height index (DHI), generated from three measurements. Within 5 hours of harvesting of the whole spine, at each time point, MRI and CT scan images were collected. Sagittal MRI scans were acquired using a 0.25 Tesla low field Esaöte G-scan imager with a T2 pulse sequence, 4mm slice thickness. Parameters included a 30cm2 field of view, a 224x208 matrix, an echo time of 120 milliseconds, and a repetition time of 2790 milliseconds. Serial axial thin-cut CT scans (Siemens, Cardiac Sensation 64 Slice, Germany) of L1-S1 were performed for all specimens. A sagittal reconstruction of images across the L1-S1 inter-transverse process regions was obtained. The images were examined by two, blinded observers experienced in MRI and CT scan image interpretation for disc health. The quality of disc health was determined by the signal intensity of the discs on T2-weighted MRI images where degenerated discs were darker coloured in predominantly the NP region. The sheep were euthanized at 4 (n=3), 8 (n=2), and 12 (n=2) months post surgery. The IVDs (L2-L5) and vertebrae were immediately procured, fixed in 10% neutral buffered formalin and thereafter decalcified in rapid decalcification solution (RDO solution, Lomb Scientific Australia). The disc tissues were cut and then paraffin-embedded for para-sagittal and coronal sectioning. The 4μm sections were stained with hematoxylin-eosin (H&E) for routine histology and Safranin-O/Fast green to identify proteoglycan (red) and collagen (blue). To semi-quantify cell numbers in the NP and inner endplate, counting of cells was performed on H&E stained sections, with 4-6 slides each, under a 20x light microscope objective. Cells were counted in randomly selected areas of the EP zones of the NP by 3 researchers independently. Cells were also counted in images of the inner NP were also counted separately by three researchers. Sections were also viewed using a digital imaging workstation under polarized light (DM6000 B; Leica Microsystems). Comparisons of inter-lamellar fibre distribution and the surrounding matrix architecture of the AF zones were made using unstained sections. Proteoglycans were visualised with Alcian blue staining. Briefly, sections were deparaffinized, hydrated through a graded ethanol series and stained in 1% (w/v) Alcian blue (Sigma) solution in 3% (w/v) glacial acetic acid, pH 4.2, for 30 minutes, followed by a tap water wash for 10 minutes. The samples were counter-stained with nuclear red solution (0.1% nuclear fast-red in 5 % aluminium sulphate), followed by several washes in water. To quantify the proteoglycans in the disc, Alcian blue stained slides were analysed using ImageJ software. Rectangular Regions of Interest (ROI) in both AF and NP were selected on scanned images of slides of each disc. The numbers of pixels in the ROI for each of 255 shades of blue were counted. The sum of these intensity values was then divided by the total number of pixels in the region, giving a (unit-less) semi-quantitative measure of Alcian blue stain for each sample. The sections were deparaffinized and hydrated through a graded ethanol series. Endogenous peroxidases were scavenged with 3% (v/v) H2O2 and non-specific binding sites were blocked with 10% skim milk powder/Tris-HCl buffer. The slides were then probed with primary rabbit polyclonal antibodies specific for type-I (1:100) and type-II (1:150) collagen (Research Diagnostics INC, Flanders NJ). The slides were treated with Multilink solution (DAKO, Sydney, Australia) followed by streptavidin-conjugated peroxidase incubation. Results were visualized with a 3,3'-diaminobenzidine hydrochloride (DAB, DAKO) solution and counterstained in Haematoxylin. The primary antibody was omitted for negative controls. Comparisons between multiple experimental groups were performed with analysis of variance (ANOVA) and Student's t test using Sigma Stat software (SPSS Inc., San Rafael, CA). X-ray images were compared before and after each time point using a paired Student's t test. All values are presented as mean ± standard error (SEM). Evidence of intervertebral disc degeneration can be visualised using magnetic resonance or x-ray imaging [19,20]. Figure 1 shows representative images of CT and MRI scanned sheep spines at 4months post annular injury (Figure 1A, B) and x-ray images of a sheep spine immediately after surgery (T0) and post mortem after 4 months (T4). Narrowing of the intervertebral disc was visible in the CT scan (Figure 1A). The MRI image (Figure 1B) reveals that the stabbed disc has deteriorated and lost its water content, displaying a darker core disc structure. This loss of hydration in the disc has also been shown biochemically  within this time frame (6 months). The control and BMP13-injected discs, however, have healthy, lighter shading in the disc nucleus. The x-ray image shows obvious narrowing of the stabbed disc from one of three sheep spines after 4 months (Figure 1C), whereas control and BMP-injected disc heights do not appear to have narrowed. After 8 and 12 months all of the stabbed discs showed narrowing, relative to control and BMP13-injected discs (not shown). Quantitative examination of the x-ray images to assess changes in DHI over time showed the disc narrowing was statistically significant in the stabbed, but not the BMP13-injected or control discs at 8- and 12-months post surgery (Figure 1D) using three independent measurements. The DHI change was not statistically significant at 4 months. Consistent with this data, moderate disc narrowing at 4-6 months post-injury was reported using this model in about half of subjects , with more consistent loss of disc height at 8-12 months. Similarly DHI recovery was reported in a rabbit model of discal injury following BMP-7  and GDF-5  injection, but not with BMP-2 expression from transfected cells . Thus it appears that injection of BMP13 at the time of injury could prevent or at least slow down the deterioration of the intervertebral disc. Examination of sections stained with H&E showed that cells appeared to be discharging from the discal side of the EP into the NP and the inner AF (Figure 2A). Most of these cells morphologically appeared round with a single nucleus, and were found in lines, aligned towards the NP and inner AF (Figure 2A). Expression of collagen II (Figure 2B), but not collagen I (not shown), was observed by immunostaining. Quantification of the chondrocyte-like cells demonstrated that a stab injury to the annulus resulted in a significant (32%) loss of cells (P< 0.05) from the disc (Figure 2C), compared with controls. However with BMP13 injection the cell numbers were boosted to the level of control discs. There was also evidence of neo-vascularization, a known response to chronic injury and a characteristic of this model , which we observed on the bony side of the EP region in injured but not in BMP13-injected disc tissues (Figure 2a). This data suggests that BMP13, when injected directly into the disc, may reverse or prevent early degenerative changes induced by mechanical injury through cell mobilization from the EP cartilage, or prevention of cell loss. Whether this effect was mediated by stimulatory signals or by the prevention of cell apoptosis, as was shown for BMP-7 in disc cells , cannot be concluded here. BMPs are known chemo attractants for many cell types [22,23] and BMP13 may also stimulate cell migration. The nature of the cells moving into the NP cannot be distinguished here, although they appear somewhat chondrocyte-like. Cells resembling progenitors have been identified in the disc NP  but lack of antibody reagents specific for sheep antigens precludes further analysis of the EP-NP zone cells in this study. Under polarized light, we observed numerous bright collagen bundled lamellae in the annulus of control discs (Figure 3A). Their bundles of collagen fibres were bright, well organized and tightly bound by the surrounding matrix. However, following annular stab injury there appears to have been a substantial loss of collagen and lamellae structure in the AF, as shown by the dull image (Figure 3A). Loss of collagen has been previously reported in the ovine annular puncture model  although it occurred more gradually over a 12 month period. Injection of BMP13 at the time of injury resulted in the deposition of a mass of collagen, visible as brightly light-reflecting collagen bundled lamellae in the AF (Figure 3A). Immunohistochemical staining with specific antibodies shows that the majority of this newly deposited collagen is collagen II (Figure 3C), as minimal staining is visible with specific collagen I antibodies (Figure 3B). 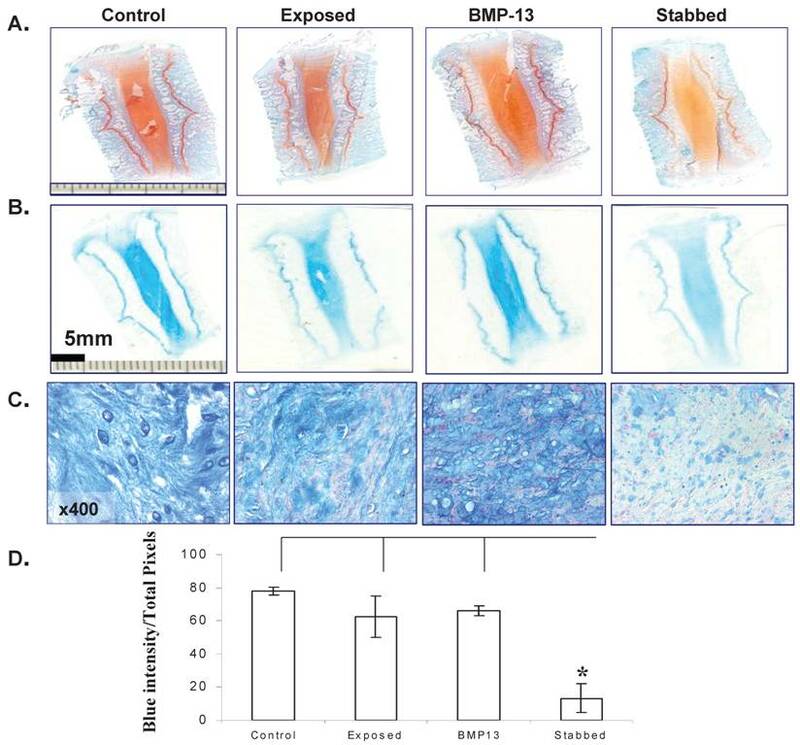 An increase in expression of collagen II (Figure 3C) in the inner region of the AF was found in the BMP13 injected group compared with stabbed or surgically exposed control tissues. This data is consistent with several previous reports demonstrating that BMP13 can induce expression of collagen II in vitro [15,25,26]. High levels of collagen II is a marker of NP tissue and a characteristic of disc-like cells. Thus, immunostaining indicates that the addition of BMP13 at the time of annular stab injury results in the retention of, or the stimulation of new synthesis of disc extracellular matrix proteins compared to annular stab alone. Histological staining of the disc tissue showed BMP13 had an effect not only on cell numbers, but on the extracellular matrix production of cells in the disc. At low magnification the original colour intensity stained by Safranin-O & light green (Figure 4A) and Alcian blue (Figure 4B) was reduced in the stabbed discs at the 4 month time point compared with BMP13 injection and controls. This was also observed in the stabbed discs at both the 8 month and 12 month time points (not shown). Under high magnification, positive blue staining was seen in both AF (not shown) and NP (Figure 4C) regions. Production of large amounts of proteoglycan in the NP of the controls and BMP13 injection group but not in stabbed disc tissue (Figure 4C) was observed. Several in vitro studies have shown BMP13 stimulation of proteoglycan production in a variety of cells [13,14,27], suggesting the increased staining in BMP13-injected tissue samples may represent new synthesis as well as retention of existing proteoglycan. This may also be the mechanism of BMP13 injection influencing the hydration of the disc tissues, as proteoglycan molecules retain water molecules. Semi-quantitation of Alcian blue stained proteoglycan demonstrated considerable loss of proteoglycan from stabbed discs, yet those which received BMP13 injection had a five fold greater intensity of Alcian blue staining, often above that of exposed control levels (Figure 4C, 4D). BMP13 injection following annular stab protects discs from degeneration. 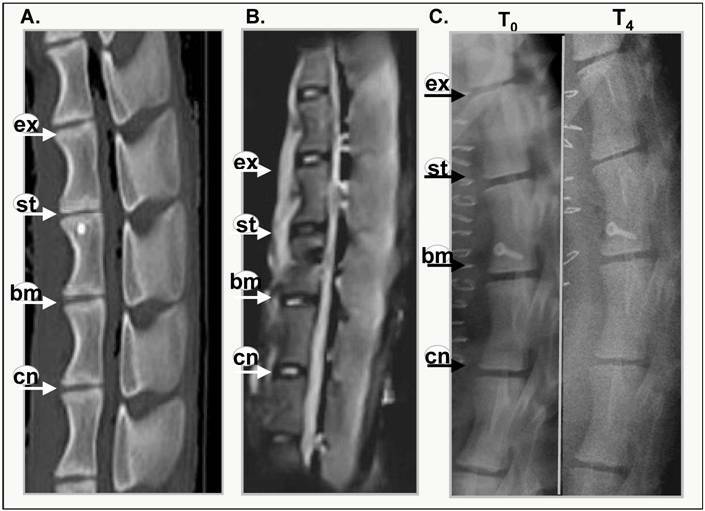 A representative CT scan (A), MRI scan (B) of lumbar discs and 4 months post surgical stab injury and radiographs immediately after and 4 months following surgery (C). Progressive changes in the stabbed discs (st) are visible in all images when compared with the untouched control (cn), the surgically exposed control (ex) and BMP13 (bm) injection. The MRI image shows the decreased signal intensity of the nucleus pulposus area for the stabbed disc at 4 months post surgery, compared to controls. The BMP13 injected disc shows the brighter, increased signal intensity for the disc area, similar to controls (B). A graphical representation of DHI shows that a significant difference in DHI was present in the stabbed disc group when “T0” and “T8/12” surgery measurements were compared at 8 months, and at 12 months (D). Measurements of vertebral body height and intervertebral disc height were obtained from radiographs using imageJ software. Disc Height Index (DHI) was calculated as previously described . *p<0.01 comparing corresponding DHI from “T0” to “Tx” surgery at teach time point. Data are presented as mean±SD from three individual blinded measurements. BMP13 injection increased cell numbers within the disc NP and inner AF. A representative image of H&E stained disc tissues shows that more chondrocyte - like cells are present at the NP - EP juncture in BMP13 injected disc tissues when compared with annular stab alone (A). These cells appear to be moving toward the region of the NP (B, top panel). Immunohistochemical staining revealed collagen II expression in the EP and in these moving cells (B, top panel). High magnification revealed that the cells were chondrocytic in appearance with a round or oval shape and a small nucleus (B, lower panel, Arrow indicated). Images were captured at x 200 (A and B, top panel) and x 1000 (B, lower panel) magnification. Graphical representations of the cell counts were performed at the NP - EP juncture under a 20X light microscope objective (C). *p<0.05 compared to stabbed or exposed disc tissues. Data are presented as mean±SE from 3 individual measurements from six sample images for each group. BMP13 injection stimulates collagen synthesis in the AF. Representative polarized light images show numerous well organized bright collagen bundled lamellae separated by an interlamellar space in the annulus of the controls (including surgically-exposed and non-visualised control discs). Even though disorganized, bright collagen lamellae were observed in BMP13-injected discs, particularly at the edges of the stab injury track itself (A). Original magnification: x100 (A-top panel) and x400 (A-lower panel). There was an observable loss of basic structure and of collagen in the stabbed discs and the stab-track continued to be obvious with limited repair (A). Immunostaining showed that collagen 1 was expressed within the bundled lamellae of the AF (B), whilst an increase in collagen II expression was observed within the lamellae of inner AF in both the control and BMP13-injected groups (C) when compared with the stabbed group at the 4 month time point (C). 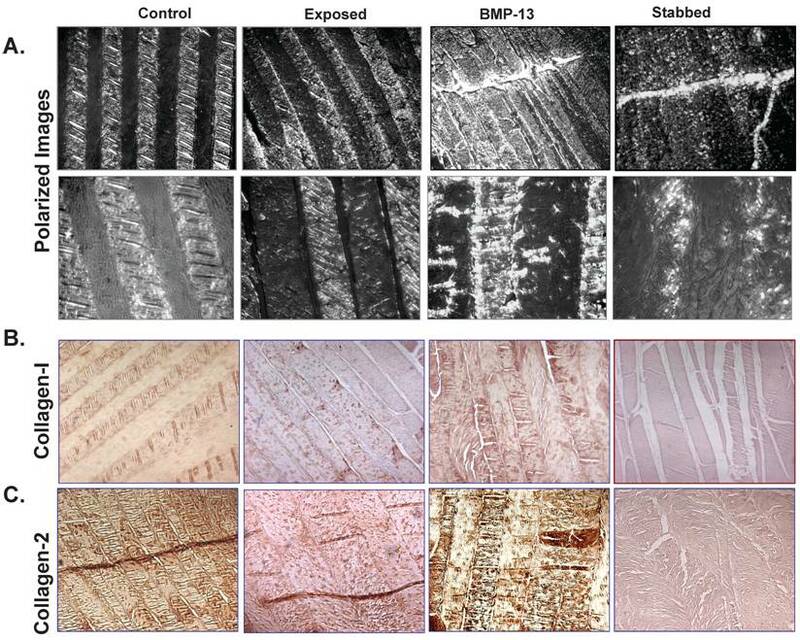 The collagen fibre meshworks which were intensively stained with collagen II were visualised with branched out collagen bundles into the interlamellar spaces in the control and BMP13 injected groups. No such collagen meshworks were observed in stabbed disc tissues (C). Original magnification: x 100 (B,C). BMP13 injection stimulated Proteoglycan production. Representative images of Safranin-O/Light green staining (A) and Alcian blue staining (B) of sheep disc tissues. Orange (A) or blue (B) colour intensity decreased in the AF of stabbed discs in comparison to control or BMP13 injected tissues. Microscopic images of the NP of discs positively stained with Alcian blue in the control and BMP13- injected tissue groups (C), but significant loss of Alcian blue stained proteoglycan in the stab-alone tissues (C). Original magnification: x 400 (C). Graphical representation of the intensity of blue stained disc tissues (D); was calculated by ImageJ software. Data presented represents the blue color intensity from total image pixles. The mean and SD for three individual samples for each group are shown. *p<0.05 compared to all the groups. This report, whilst using small numbers of animals, provides us with encouraging evidence of the efficacy and potential of BMP13 for the treatment of intervertebral disc degeneration. The annular stab injury resulted in detectable disc deterioration as early as 4 months and clearly demonstrated the loss of disc extracellular matrix proteins as well as disc narrowing and water loss. 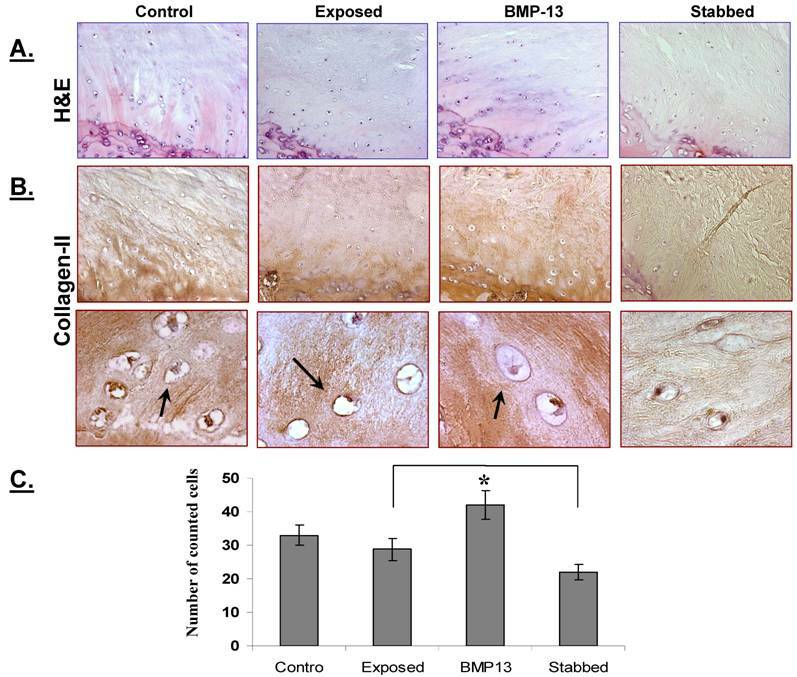 A single injection of recombinant BMP13 improved the disc health following annular stab in every parameter studied, including protecting the disc from narrowing and replenishment of the extracellular matrix. This represents the first demonstration of BMP13 as a candidate therapeutic agent and suggests further, larger studies to assess efficacy and safety are immediately warranted. The authors would like to thank Hadi Ahankoob (ADDvantage Imaging, Rockdale, NSW) for assistance with the MRI images; Symbion Imaging, St George Private Hospital (Kogarah, NSW) for the CT scans; and Camden Veterinary Centre for providing x-ray images and animal husbandry. The authors declare that Dr Williams, Dr Bhargav and Dr Wei were at some stage employed by Cellixe Pty Ltd, and that this work was supported by a grant from Cellixe to the University of New South Wales.